How Does OSOP’s From The BackSide Get It’s Selections? How Many Horses Are Selected Per Race? How Should I Bet The Selections? Some Of The Horses Selected Didn’t Run At All. Why Is This? What If The Races Were Cancelled? All OSOP From the BackSide Horses are posted within the “OSOP Picks” category. Every day this category will be updated with the following day’s selections. By using the Oldest System on the Planet, the BackSide provides horse racing selections every day for every North American track that’s running that day. If you own a copy of the Oldest System on the Planet, then you already know how each horse is selected, but if you do not own a copy of OSOP, you can pick up a copy at HorsePlayerHaven.com. The amount of OSOP horses in a race can vary from race to race, so to keep things simple, there can be no more than 2 qualifying OSOP horses in any given race otherwise the race is culled. Some races will have only 1 qualifying OSOP selection, while others may have 2. Other races will be skipped altogether. UPDATE- 3-10-2013- In some instances, there will be OSOP horses that run out strong at the first of the race, but never really finish well. These are what I call “terminal quitters”. As an added bonus to the BackSide selections, I am looking over every OSOP horse in every race and if I see the potential for an OSOP selection that is showing signs as a terminal quitter, this horse will be removed from the selections as well. This will be a great added bonus to BackSide members in an effort to raise our percentages and eliminate some horses that just will not get there for us. This, of course, is entirely up to you. The horses are listed in the order in which they appear on the form, so there is no importance placed on the first listed horse over a second listed horse. Whether you bet one or both is up to your discretion. You may also choose to bet an exacta, daily doubles, pick 3′s, pick 4′s, etc. Again, this is your decision. OSOP’s From the BackSide only provides you with the qualifying OSOP horses in any given race, the rest is up to you! Because selections are made at least one day in advance, some horses may scratch before a race. The reason why a horse may scratch can vary and sometimes happen as late as right before the race. If a horse does scratch, you may very well see him in an upcoming race. If the horse is a qualifying OSOP From the BackSide horse, we’ll be sure to post him again. All OSOP From the BackSide results are posted within the “OSOP Results” category. Every day this category will be updated with the previous or current day’s results. From time to time, we like to show off some of our more outstanding winners. We try to do this at least once a week, but posting dates on BackSide Replays may vary. This videos will show the actual race so that you can see the OSOP horse or horses run! All BackSide Replays will be posted in the “BackSide Replays” category for your viewing enjoyment. In the example above, we added up every win and place payout (based on our $2 wager standard) and posted the top 5 win/place money tracks. This can be very handy! If you are unsure of what tracks to bet with OSOP’s From the BackSide selections, this can help steer you in the direction of the tracks that have been successful over the past 2 weeks with OSOP. If you are looking for higher earnings, this is definitely a great way to go. As an added bonus, we break this down even further in two ways. We provide the top 5 win money tracks, focusing only on win payouts for OSOP horses and for those of you who like making place bets, we list the top 5 place money tracks. This will provide you with the top 5 hot win/place percentage tracks. We take the number of selections for a track, minus scratches and race day cancellations, and compare it to the number of actual wins and places to indicate the percentage of win/places each track has earned during the last 2 weeks. For those of you who like a higher consistency of win/places, this is the stat for you. As an added bonus, we break this down even further in two ways. We provide the top 5 win percentage tracks, focusing only on wins for OSOP horses and for those of you who like making place bets, we list the top 5 place percentage tracks. In the example above, we added up every win and place payout (based on our $2 wager standard) and posted the bottom 5 win/place money tracks. This can also be very handy! If you are unsure of what tracks to bet with OSOP’s From the BackSide selections, this can help steer you away from tracks that have been less successful over the past 2 weeks with OSOP. Every track has it’s own hot and cold spells, so it is in your best interest to note the cold tracks. As an added bonus, we break this down even further in two ways. We provide the bottom 5 win money tracks, focusing only on win payouts for OSOP horses and for those of you who like making place bets, we list the bottom 5 place money tracks. This will provide you with the bottom 5 cold win/place percentage tracks. We take the number of selections for a track, minus scratches and race day cancellations, and compare it to the number of actual wins and places to indicate the percentage of win/places each track has earned during the last 2 weeks. For those of you who like a higher consistency of win/places, this will alert you to the low percentage tracks over the past two weeks. As an added bonus, we break this down even further in two ways. We provide the bottom 5 win percentage tracks, focusing only on wins for OSOP horses and for those of you who like making place bets, we list the bottom 5 place percentage tracks. In the example above, we simply listed the best 3 exacta payouts OSOP’s From the BackSide produced in the last 2 week period. 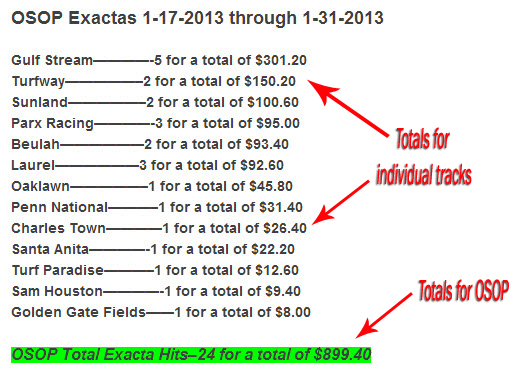 Looking for the next big payout track in exactas? This would be a good place to start. This gives you every track from that time period, the total number of exacta hits for that track and the total amount of earnings that particular track produced in exacta earnings (based entirely of off the $2 standard wager as explained above). The very bottom line of this section will list OSOP Total Exacta Hits, how many there were and the total dollar amount they produced. This will be highlighted in green. The rest of the exotic stats are listed in the same way, providing an image for the top 3 hits, then listing the tracks, how many hits and what the total dollar amount for that track is. Each section is broke down by Daily Doubles, Pick 3′s, Pick 4′s, etc. depending on what exotics OSOP’s From the BackSide produces. Hi Mike……Have you considered putting OSOP on software and make it available to your customers? Hi Herman! An OSOP software is an option I have looked into in the past. The problem with this idea is developing a software that can pull specific information from the racing form. Not being “tech” savvy, I’ve asked around and the developers I’ve talked to in the past said that the cost to develop something like this would be much higher than I had anticipated! That’s when I first started thinking about From the BackSide and well, here we are! Yes! We just started covering Hazel on the Backside. On the hot track results is the money listed profit after subtracting $2 for win / place?